To execute operations, commanders conceptualize capabilities in terms of combat power. Combat power has eight elements: leadership, information, mission command, movement and maneuver, intelligence, fires, sustainment, and protection. The Army collectively describes the last six elements as the warfighting functions. Commanders apply combat power through the war fighting functions using leadership and information. Combined arms maneuver and wide area security, executed through simultaneous offensive, defensive, stability, or defense support of civil authorities tasks, require continuously generating and applying combat power, often for extended periods. Combat power is the total means of destructive, constructive, and information capabilities that a military unit or formation can apply at a given time. Army forces generate combat power by converting potential into effective action. To execute combined arms operations, commanders conceptualize capabilities in terms of combat power. 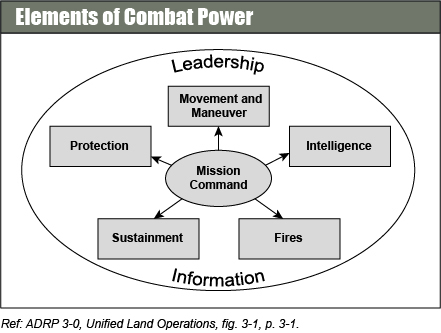 Combat power has eight elements: leadership, information, mission command, movement and maneuver, intelligence, fires, sustainment, and protection. The Army collectively describes the last six elements as the warfighting functions. Commanders apply combat power through the warfighting functions using leadership and information. Generating and maintaining combat power throughout an operation is essential to success. Factors contributing to generating combat power include employing reserves, rotating committed forces, and focusing joint support. Commanders balance the ability to mass lethal and non-lethal effects with the need to deploy and sustain the units that produce those effects. They balance the ability of accomplishing the mission with the ability to project and sustain the force. Commanders apply leadership through mission command. Leadership is the multiplying and unifying element of combat power. The Army defines leadership as the process of influencing people by providing purpose, direction, and motivation, while operating to accomplish the mission and improve the organization. An Army leader, by virtue of assumed role or assigned responsibility, inspires and influences people to accomplish organizational goals. Information enables commanders at all levels to make informed decisions on how best to apply combat power. Ultimately, this creates opportunities to achieve definitive results. Knowledge management enables commanders to make informed, timely decisions despite the uncertainty of operations. Information management helps commanders make and disseminate effective decisions faster than the enemy can. Every operation requires complementary tasks of inform and influence activities that affect the commander’s intent and concept of operations. Every operation also requires cyber electromagnetic activities. These activities ensure information availability, protection, and delivery as well as a means to deny, degrade, or disrupt the enemy’s use of its command and control systems and other cyber capabilities. Commanders use information and a mission command system to understand, visualize, describe, and direct operations. This article is an extract from “AODS6: The Army Operations & Doctrine SMARTbook, 5th Ed. (Guide to FM/ADRP 3-0 Operations & the Elements of Combat Power)” by The Lightning Press. Download a free PDF sample and learn more at: AODS6: The Army Operations & Doctrine SMARTbook, 5th Ed. (Guide to FM/ADRP 3-0 Operations & the Elements of Combat Power).